"Won't you be my neighbor?" he asked at the beginning of all 895 episodes. For the better part of 33 years, viewers answered Fred Rogers with a resounding "Yes." The gentle kids' show he created and hosted, Mr. Rogers' Neighborhood, brought millions into the fantasy world inhabited by the likes of King Friday XIII, Henrietta Pussycat and Anna Platypus. 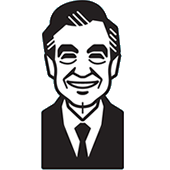 With his trademark sweaters and nurturing demeanor, Rogers charmed two generations of children on his Mister Rogers' Neighborhood television program. The Presidential Medal of Freedom winner began all 895 shows singing, "Won't You Be My Neighbor?" Read more HERE about Mister Rogers' star on the Hollywood Walk of Fame.